As we turn our thoughts to the holidays and start to focus on celebrating with family, friends, and community and I wanted to extend a warm thank you to all. We have been very fortunate in wine country over the last couple years, capping it off with another strong harvest expecting a total of 4 million tons of grapes in California. Another reason to be grateful is that prices for vineyards and real estate have improved dramatically over the last 4 years and vineyard prices have come back in line with where they were before the recession. Even after such a strong move, prices appear to be stable. 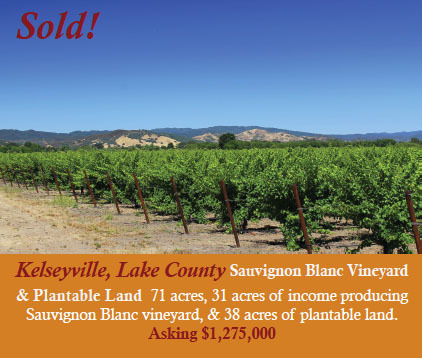 Taking a quick look at the numbers you can see that over the last year there have been more than $335,000,000 in sales of vineyards, vineyard estates and plantable land in Napa and Sonoma Counties. This doesn’t even take into account confidential sales or wineries. It’s an astonishing number. Thank you real estate buyers & sellers! 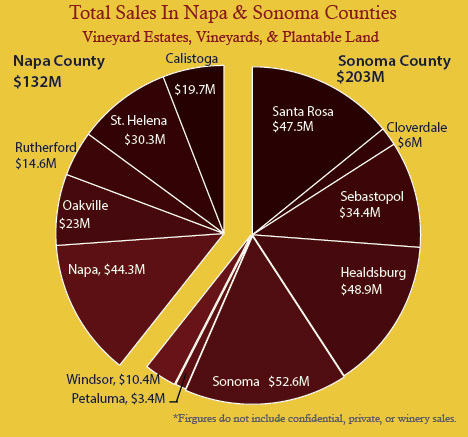 Looking at the pie chart below you can see that Sonoma County came in with just over $200 million in sales of vineyard, vineyard estates and plantable land. In total Sonoma had 78 transactions. Napa on the other hand, clearly not one to be left behind, had $132 million in sales with 33 transactions. 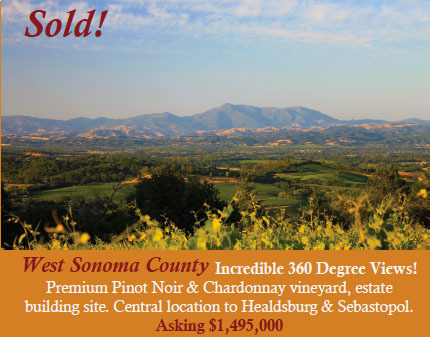 While Sonoma County has a larger playing field, Napa still reigns in the higher prices. 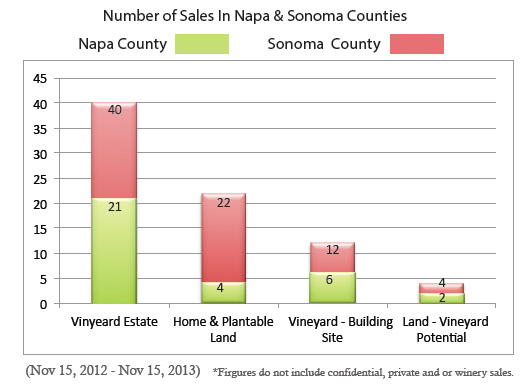 Further below you will find a chart that shows how many of each type of property sold in both Napa and Sonoma Counties. *Figures do not include confidential, private or winery sales. With another large harvest in 2013 both growers and wineries have been fortunate. The combination of an abundance of grapes, high quality fruit and solid grape prices puts everyone in a jolly spirit moving towards year-end. 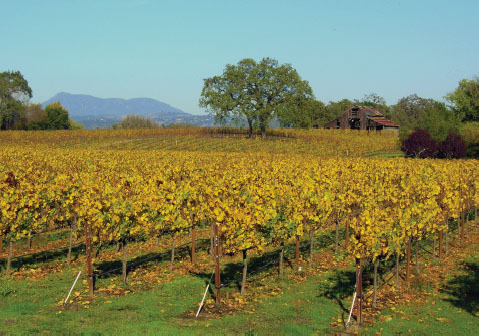 Even so, wineries had a capacity crunch as harvest rolled in. For example, two years ago, there were 30,000 gallons of bulk Napa Valley Cabernet for sale, by mid 2013, there were 600,000 gallons of bulk Napa Valley Cab for sale. Too much of a good thing? Consider this snapshot, even with the large harvest of 2012 increasing the bulk wine supply, millions of gallons of bulk wine continued to sell over a two month period last summer. The 2013 harvest will certainly add to the supply, but demand is strong and increasing. Thank you wine lovers! Also, let’s keep in mind that all it takes is one short harvest to tighten things up again. The stock market has been at record prices recently and tech company IPO’s have been flying off the shelf. 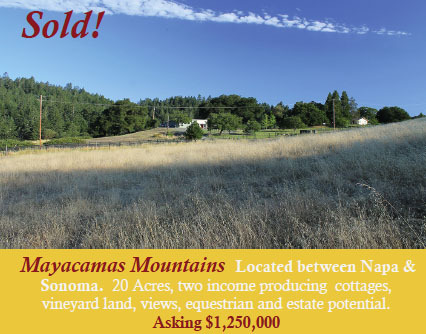 With the market continuing to push ahead and new millionaires being created by the likes of Twitter, Barracuda Networks, Google and Facebook my expectation is that we will continue to see the lifestyle buyer looking to wine country for a real estate asset that fits nicely into their portfolio. A place to enjoy, share with their friends and appreciate (pun intended) over time. Thank you stock market, Silicon Valley and Mark Zuckerberg! Within the wine industry itself, mergers and acquisitions continue with numerous high profile transactions taking place. 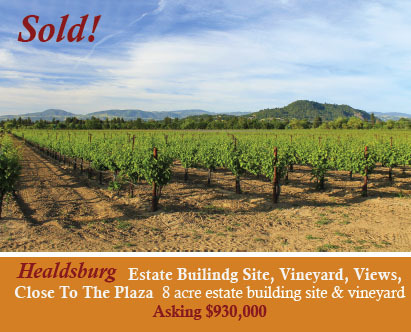 The wine industry and wine country real estate are strengthened by an improved economy, increasing wine demand, wineries desire to control expenses by acquiring vineyards, and much improved grape prices over the last several years. Even lenders that work within the wine industry are busier than they’ve been in years as new and old players look to leverage assets and grow their business. Appraisers are also extremely busy with most booked out several months if they’re available at all. All positive signs with respect to a region showing that the gears are moving in a positive direction. Thank you number crunchers, appraisers and finance gurus! Wine continues to attract new consumers and bring more interest to the area. The Gen X and Millennial groups have come to the table, keep in mind, this is the age group that is helping ramp up the energy in Silicon Valley and other areas, and clearly have a spillover effect in wine country. There’s still plenty of room to grow the wine business across new segments, as an example one wine industry financial analyst sees the opportunity to sell 50 million cases of wine into the Hispanic community over the next 20 years. This denotes just one of many relatively untapped markets. Along with continued interest from international buyers, local hot spots in the bay area like the Silicon Valley and San Francisco, and many other domestic buyers throughout the United States. Thank you Gen X, Millennials and untapped markets! All the elements I mentioned affect the value of land, vineyards, vineyard estates and wineries. But there’s still one thing I haven’t mentioned. We live in an incredibly beautiful, bountiful and special region. There’s no other place in the world like our own back yard. For that I’m thankful to call wine county home and wish you all joy filled holidays and an exciting and prosperous new year!